Master singer-storyteller John Michael Talbot's concert meditations-heard and appreciated by millions of concert-goers over the last halfcentury-are now available in this unique volume. This collection of parables and stories reveals Talbot's mystical, monastic heart and gives him an opportunity to present the Christian faith in holy and ordinary language. As Talbot's music became more popular over the years, he began to immerse himself in the teachings of the contemplatives, mystics, and monastic fathers and mothers of the Christian tradition. In time he began to share some of that teaching with his audiences between songs during concerts and during retreats, parish missions, and diocesan conventions. While on stage, this Grammy-winning contemporary Christian music pioneer is known as much for his stories between songs as he is for his playing and singing. Talbot fans will savor his wise reflections on the mystery of the Trinity, the intimate love of Jesus, the Sermon on the Mount as the heart of Christian teaching, and the need to find what he calls our own "inner room" for prayer and contemplation. Lessons from a Troubadour gathers this material into book form for the first time. Talbot's words open an important window into understanding the Catholic faith. Both inspiring and practical, you'll find ways to apply it to your daily life as well. 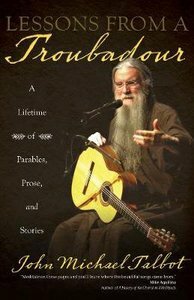 About "Lessons From a Troubadour: A Lifetime of Parables, Prose, and Stories"